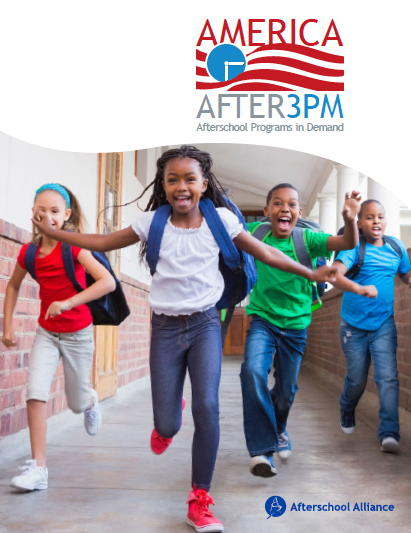 At the end of last year, the Afterschool Alliance released an important study entitled America After 3PM. They began issuing this study in 2004. This report included key 2014 findings on the use and demand for afterschool programs and a state-by-state review of the status of afterschool. Below, we cite some key findings from the national study, which can serve as a pocket guide for every afterschool program leader and advocate. We also share part 1 of an interview with Jodi Grant, Executive Director of the Afterschool Alliance. Q: The Alliance recently published an important report entitled America After 3PM. Can you briefly describe what this report is about and who is it intended to reach? A: America After 3PM is the largest household survey on what children are doing between the hours of 3 and 6 p.m.–after the last school bell of the day rings and before parents typically return home from work. The goal of our survey is to not only document the number of children who are alone and unsupervised during the after school hours and the number of children who are in an afterschool program, but to quantify the need for afterschool programs in communities across the country. America After 3PM is the opportunity to capture the information necessary to better understand what the demand for afterschool programs is, both nationally and at the state level. It is intended to serve as a resource for the afterschool field, advocates, educators, parents and policy makers, providing them with the data that can help them make informed decisions on how to best support the children and families in their communities when it comes to the after school hours. Q: Can you explain why the Alliance researched and published this report? A: We first embarked on this research back in 2004, when important questions regarding the number of children in afterschool programs, the number of children who are alone, and the number of children who want to participate in an afterschool program, but are unable to, were raised time and time again, and each time, no definitive informational source was available to answer these questions. We went into the field in 2004 to collect what would be our baseline data, and again in 2009. This year, our research and report spans a decade worth of data and builds off of what we learned through previous editions of the research. The report examines participation disparities by income and race and ethnicity. We also believe that the quality of afterschool programs is incredibly important, which is why we ask parents about their experience with their child’s afterschool program and report on parental satisfaction with their afterschool program, the types of activities offered in programs, and the outcomes and benefits associated with participation in afterschool programs. Q: Were there any surprises that came as a result of your research? A: When we first started on America After 3PM, one of our hypotheses was that as participation in afterschool programs increased, the unmet demand for afterschool programs would decrease—a basic supply versus demand scenario. Over the past 10 years, afterschool program participation has increased by more than 50 percent–from 6.5 million children in 2004 to more than 10 million children in 2014. But, we found that unmet demand for afterschool programs has also seen a steady increase over the past decade, growing from parents of 15.3 million children saying they would enroll their child in an afterschool program if one were available to them, to parents of close to 20 million children in 2014. The fact that unmet demand continues to grow while participation is also growing may be a sign that afterschool is becoming more of an expectation among parents. We found that this year more than half of all school-age children in the U.S. either are in an afterschool program or would be if more afterschool programs were available. That means that there are close to 30 million students who have some form of demand for afterschool programs. Q: What do you believe is the most important takeaway from this report? A: The most important takeaway from this report is that while we have seen much progress in the number of children and youth taking part in afterschool programs, we still have so much more work to do. For every one child in an afterschool program, two more children are waiting to get in based on parents surveyed. We need increased investments in afterschool at all levels—federal, state, local and private—to ensure that all children are able to take part in an afterschool program that keeps them safe, inspires learning and supports working families.